Attendees at the Democratic National Convention in Philadelphia later this month will be welcomed at Philadelphia International Airport with a soundtrack featuring Philadelphia-made hits and an exhibition of political pins. The soundtrack, playing now, features the “Sound of Philadelphia,” a series of songs from Philadelphia’s Grammy award-winning producers and songwriters Kenny Gamble and Leon Huff that became hits for artists such as Harold Melvin and the Blue Notes, Teddy Pendergrass, the O’Jays Patti LaBelle, the Stylistics and many others. Gamble and Huff’s well-known songs being heard on the audio system throughout the terminals include I Love Music by the O’Jays, The Love I Lost and If You Don’t Know Me By Now by Harold Melvin and the Blue Notes, Me and Mrs. Jones by Billy Paul, Ain’t No Stoppin’ Us Now by McFadden and Whitehead, Rubberband Man by the Spinners, and Don’t Leave Me This Way by Thelma Houston. 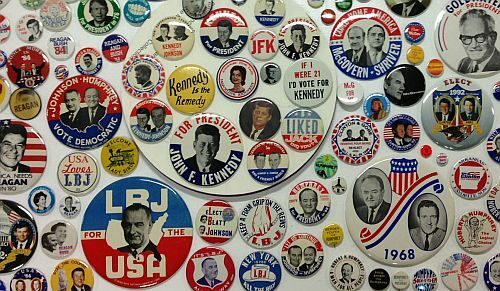 The exhibition of political pins – post-security in Terminal B – is from the collection of Philadelphian Alfio J. Brindisi, who has been collecting American political memorabilia for nearly 50 years.